by Manuel Mogato and Ben Blanchard | Reuters – The Philippines accused China on Tuesday of violating an informal code of conduct in the South China Sea by planning new structures on a disputed shoal, as China’s premier told Southeast Asian leaders Beijing was serious about peace. Chinese Premier Li Keqiang (R) shakes hands with Myanmar’s President Thein Sein ahead of the 10th China-ASEAN Expo in Nanning, Guangxi Zhuang Autonomous region, September 2, 2013. Friction over the South China Sea, one of the world’s most important waterways, has surged as China uses its growing naval might to assert its vast claims over the oil- and gas-rich sea more forcefully, raising fears of a military clash. Four of the 10 members of the Association of Southeast Asian Nations (ASEAN), including Vietnam and the Philippines, have overlapping claims with China. Philippines Defense Secretary Voltaire Gazmin told a congressional budget hearing in Manila that China had violated the DoC by getting ready to build new structures on the disputed Scarborough Shoal. “We have … sighted concrete blocks inside the shoal which are a prelude to construction,” Gazmin said, displaying air surveillance photos of the rocks. He said the photos were taken on Saturday, describing them as a worrying pattern of constructionthat would be similar to the building of a garrison on Mischief Reef in the late 1990s. Chinese Foreign Ministry spokesman Hong Lei said he had “no information” about Gazmin’s accusations. Regional security scholar Ian Storey said that if Gazmin was correct, it would mark the biggest violation yet of the 2002 declaration. 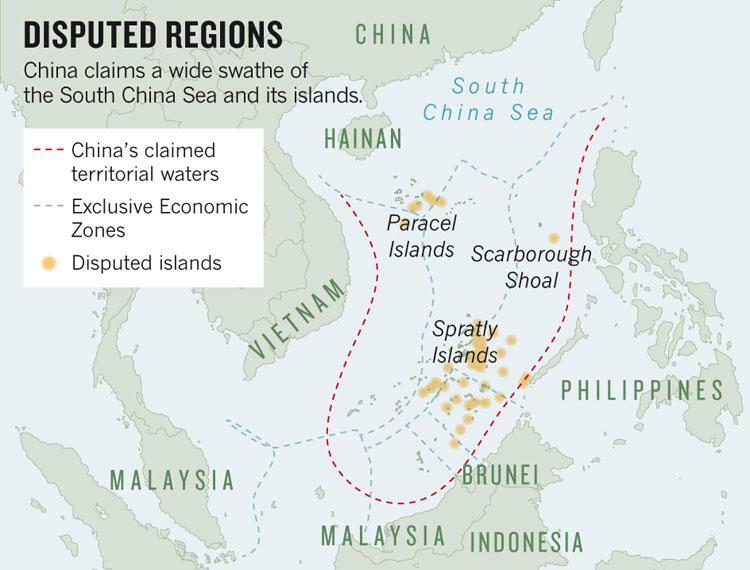 “If China starts building at Scarborough, then it is an occupation and, I believe, the most egregious violation yet of the 2002 declaration,” said Storey, who is based at Singapore’s Institute of South East Asian Studies. Speaking at a China-ASEAN trade fair in the southern Chinese city of Nanning, Chinese Premier Li Keqiang said his country was serious about wanting a peaceful resolution to the South China Sea disputes, though signaled it was in no rush to sign a long-mooted accord to replace the DoC. After years of resisting efforts by ASEAN to start talks on an agreement on maritime rules governing behavior in the region, the so-called Code of Conduct, China has said it would host talks between senior officials this month. Li said China had always advocated talks on the South China Sea on the basis of “respecting historical reality and international law”. “The Chinese government is willing and ready to assume a policy of seeking an appropriate resolution through friendly consultations,” Li told the audience, which included Vietnamese Prime Minister Nguyen Tan Dung and Thai Prime Minister Yingluck Shinawatra. China would “proceed systematically and soundly push forward talks on the Code of Conduct for the South China Sea”, Li said without elaborating in comments aired live on state television. He also repeated that talks on the dispute should only be carried out between the parties directly concerned, Beijing’s standard line which rejects the involvement of outside parties such as the United States or multilateral forums. Washington has not taken sides, but Secretary of State John Kerry reiterated in Brunei in July the U.S. strategic interest in freedom of navigation through the busy sea and its desire to see a Code of Conduct signed quickly. Critics say China is intent on cementing its claims over the sea through its superior and growing naval might, and has little interest in rushing to agree to the Code of Conduct.